→Does Tannic Acid Kill Dust Mites? Does Tannic Acid Kill Dust Mites? Tannic acid is a tried-and-true method of dust mite removal and pet dander. Since it is safe, according to the Food and Drug Administration, it’s also a healthy way to get rid of annoying dust mites. Tannic acid is a plant-derived substance that is used in food products, such as beer, soda, and juice. It’s used to help enhance taste and stabilize color. Oddly enough, though, it is most readily available for affordable purchase from photography shops, since it’s essential in the production of cyanotypes! Tannic acid definitely has a wide range of uses, but its most important use for those of us with dust mite allergies is its ability to break down dust mites and cat allergens. A study through the University of Virginia found that tannic acid is an effective way to reduce dust mites allergens in carpet, as long as treatments are applied regularly. A solution of 3% tannic acid, the study found, can reduce dust mites allergens by about 64%. In order to maintain this reduction, treatments must be done fairly frequently. Another study, led by Suzanne Lau, showed more dismal results. This study used a solution of 1% tannic acid that was sprayed on carpet. The study focused on 30 different homes where children with dust mite allergies lived. In the end, the tannic acid solution only reduced the dust mites allergens in carpet by less than 20%. The takeaway from these studies is that tannic acid is definitely an effective way to denature dust mites allergens, but treatment solutions must contain enough tannic acid. The second study didn’t have stellar results, but this can be attributed to the fact that only 1% of the treatment solution was composed of tannic acid. The solution in the first study was 3% tannic acid, and it removed more than half the dust mites allergens in the carpets tested. In order to achieve significant results, there must be the proper amount of tannic acid in the solution. The liquid spray is ideal for carpets and rugs, although you can spray it on some types of furniture upholstery, as well. To use the Allersearch spray product, spray the solution on carpet or other surfaces to dampen them. When it dries, you can vacuum it up. You only have to do this every two to three months. 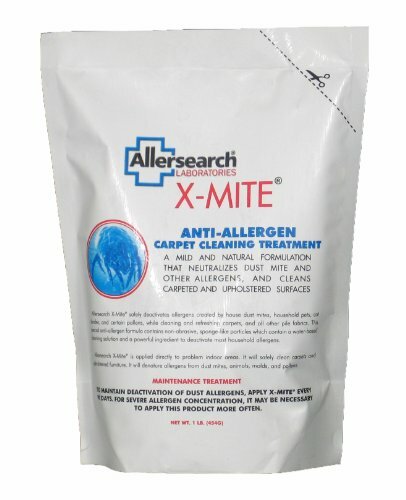 Like the spray, the Allersearch X-Mite Powder can be used on carpets, rugs, and various types of upholstery. All you need to do is brush it onto furniture. While you should leave it on the treated surface for three hours, the surface will remain dry instead of being wet, and you don’t have to deal with liquid taking longer than expected to dry. Also, it does not carry the risk of staining light-colored fabrics.